Cobra Files centers on an elite team of Joes tasked with hunting down and eliminating Cobra-centric schemes and individuals, a high-risk undertaking, indeed. An integral part of this team is Chameleon, once a Cobra agent who has defected to the other side. Her history is relayed quickly and efficiently, so as to bring any readers up to speed who haven’t been closely following the G.I. Joe comics, which included me. There are various characters and information that come from earlier stories in other recent Joe comics, but there is enough explanation that you get the picture, and the story quickly moves on into new and exciting territory. This is a dark and brooding take on the G.I. Joe universe, rooted very much in a serious, militaristic reality, though there are still adequate amounts of astounding set pieces, sword and gunplay, and code names. All of the characters take themselves very seriously, as they should in their line of work, but I would have enjoyed a slight respite from all of the dour faces and situations. There is a wonderful Snake Eyes joke that you can’t help but laugh at, because being a G.I. Joe fan, you just get it, and Tomax, one half of the classic Cobra twin duo of Tomax and Xamot, brings some uneasy, menace-tinged humor into the mix from time to time. Emotions are very prevalent in The Cobra Files, and while everyone is mostly serious, it is largely because each character is dealing with their own personal issues and demons, an element I thoroughly enjoyed. This is a strong, character-driven book, focusing specifically on Chameleon, but we get to learn about the other characters' emotions and pasts either through her, or in her interactions with them. For me, one of the most entertaining and rewarding characters was Ronin, an intense and insanely skilled female assassin, and a character who was completely new to me. Every character in Cobra Files is compelling in one way or another, and this first volume, which collects issues one through four of the series, is setting up a longer story arc that is sure to continue delivering thrills while increasing the main characters’ complexities and relationships. Fuso’s art is detailed and perfectly conveys the sense of danger hanging over the Joes activities. The action set pieces are visceral and have a smooth sense of motion to them, especially one involving Lady Jaye and a motorcycle. You get swept up into the action right alongside the team, and Chameleon’s narration helps to keep perspective of how deadly their job is, and also how important. Her narration provides us with insight, as opposed to actually narrating the plot of the story, which is a good thing. One issue that did bug was that there were too many shadows throughout the book. At times, it felt as if more than half of the lights were out in the Joes' headquarters, or that they just enjoy working in deep shadows for some reason. The look definitely fits the tone of the book and complements the secret intelligence and covert op thrust of the missions, but I feel some of Fuso’s art is lost in the shadows, and they sometimes made it hard for me to read a character’s facial expressions, which also fits with the style of the book. The deep, seemingly consistent shadows are simply not my preferred style. 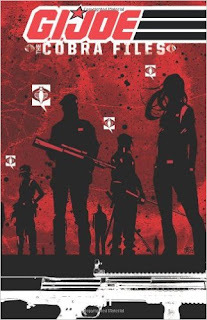 It is worth mentioning that this collection does include some stellar variant covers and pin-up art, and I absolutely loved Fuso’s sparse, electric cover; the silhouetted characters are mysterious and powerful, and the Cobra word bubbles carry a sense of menace that just begs you to open up the book and start reading. 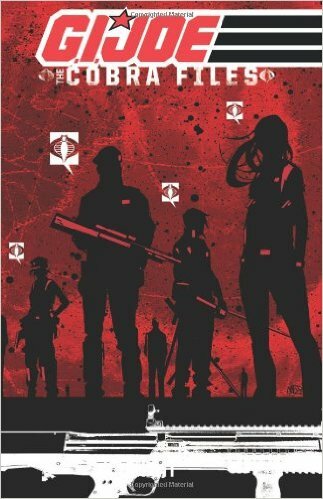 Costa’s writing is gritty and peppered with pertinent military lingo, giving the aspects of the Joes’ security protocol and intelligence gathering a real-world feel, which elevates the more straightforward action adventure style of G.I. Joe, which I do still love, but this book has some weight to it. There are real risks and stakes, and Costa does not pull any punches with his storytelling or his characters' emotions. The Cobra Files is an intriguing, intellectual, and emotional story about what happens between and underneath the cracks and what covert espionage looks like within the secret world of G.I. Joe. With a former Cobra operative as our guide, this title is all the more complex and worthy of a read, because just like the Joes, we never know quite how things are going to turn out, but we’re still excited to dive in headfirst, though the more intelligence we’ve gathered ahead of time, the better.